When I was in sixth grade or so, I read Frozen Star by George Greenstein. I’m fairly sure that was my first real exposure to modern astrophysics. My family owned Our Universe, a lovely picture book by Roy A. Gallant from National Geographic, which provided a pretty thorough overview of the state of astronomy at the time, but at the time I was more interested in the sections on Jupiter and Mars than the later ones on stars and cosmology. Greenstein’s book spurred me in a different direction. I haven’t read it since then, but if memory serves, Frozen Star covered a wide range of topics, running from the deaths of stars to then-current thinking about black holes. In the early 1980s, astronomers were gradually accepting that many weird galactic phenomena — quasars, radio galaxies, and other objects — could all be understood as the activity of huge black holes at their centers. The existence of these supermassive black holes has since been confirmed, with some truly huge specimens like the one in M87 weighing in at nearly 8 billion times the mass of the Sun. Since then, the unified model of active galactic nuclei explained that all these disparate black hole behaviors are an effect of our angle of viewing. 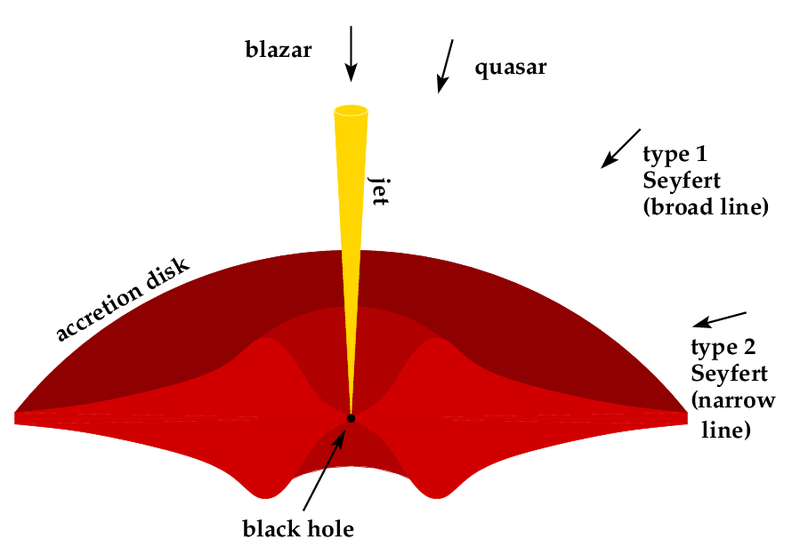 That’s worthy of a post in its own right (and I’m sure there are many good descriptions out there), but briefly: a feeding black hole gathers a disk of matter around it. As this material orbits, it heats up and emits a lot of light. Some of it, as it falls close to the black hole, can be channeled into powerful jets stretching for thousands of light-years. If we happen to be looking nearly down the barrel of that jet, we might see it as a point of light: a quasi-stellar object, or quasar. If we’re seeing things from an angle, the jet may appear as a giant lobe of radio-emitting gas. It’s a beautiful and elegant model, unifying a lot of disparate astronomical observations with a single explanation. My sixth grade self was fascinated by everything I read, for the novelty if no other reason. The very idea of black holes, much less supermassive black holes, boggled my mind. However, everything I read at the time made me think I wouldn’t be good enough: all the books and articles I could find emphasized how complicated the math was. General relativity is hard, they proclaimed. I remember telling people at the time that I was interested in astrophysics, but wasn’t sure I would like all that math…and I was a very good math student. I decided subsequently to look at more practical fields. Of course, like most young people, I switched up what I wanted to do fairly frequently. I recall thinking I could end up as a fantasy fiction writer, an aerospace engineer, an electrical engineer, even a philosopher of science. (That was a practical idea.) However, at some point in college, the mathematics started making sense: my classes got easier for me instead of harder, and I grew to make the connections between the pure math and the physics I was learning. By the time I got to general relativity — and black holes — my early love came back, stronger than before. I wonder sometimes if I would have considered studying astrophysics and black holes specifically earlier on, had the stigma against math and the warnings that this stuff is HARD not existed. Sure, the math involved in general relativity is complicated, compared with high school algebra and arithmetic, but it makes sense. How the geometry of spacetime fits, and what it means about gravity together make for one of the most beautiful theories in all of science. To this day, general relativity remains my strongest scientific love. I can’t claim it’s my first scientific love (that would be paleontology, since I was one of those dinosaur-obsessed kids), but it was perhaps my first mature scientific love. I know I’m not alone — there are far too many books on general relativity and black holes, so it’s unlikely I’ve got anything particularly profound to say on the topic that hasn’t already been written — but perhaps maturity means admitting one’s love in public, and letting that love be the guide to where one should go.